Ben loves history, too. He especially enjoys historical fiction and biographies. But oftentimes I find it difficult to find great history books that are both appealing to an 11-year-old boy and written from a Providential perspective. So much of todays writings are rife with revisionism. Recently, I purchased a Kindle Touch for Ben, mostly because of all of the public domain books I can find for free on the internet. I have spent many hours trying to find as many public domain books for history, written from a worldview acceptable in our home. If only I had known that someone else had already done that work for me. And made it even better. 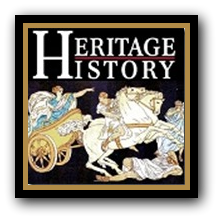 Heritage Classical Curriculum is a living books reading program that uses narrative histories, written before 1923. Books that were popular with young readers in earlier generations have been compiled onto 5 different CDs. They have compiled these books, mostly from the public domain, and added historical maps, timelines, and summaries of the era. We received the Young Readers Collection CD and Teacher’s Guide for review. The Young Readers Collection will give your student a great overview of the history of Western Civilizations, including early American History, European History, Ancient History, and Bible History. Included on the CD are 86 books, written for the elementary-aged student. 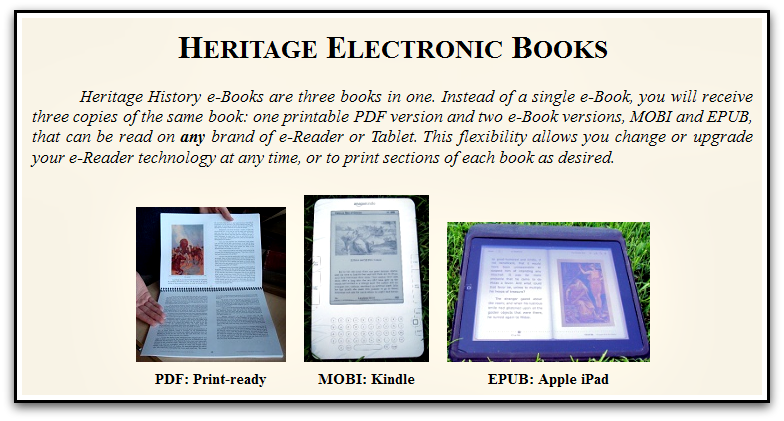 The books on the CDs, can be downloaded and read on your computer, printed and bound, or transferred to your ereader as mobi or epub files. I had no trouble transferring books to Ben’s Kindle. We are currently studying the Civil War, and found several books to read for this study. In particular, we loved a book entitled American Stories IV, written just 26 years after the Civil War ended. As you can imagine, the author’s perspective is quite different that that of someone writing about that war today. She had access to folks who fought in the war, likely family members, friends, and neighbors. We have used these books both as read alouds and for Ben to read as homeschool assignments. Living books have always been my preferred way to teach history, so we are thrilled to have such a high quality collection of books, literally at our fingertips. Along with the books, you will find the Compact Library. The Compact Library contains all of the files you need to navigate the collections — categorized to make it easy to use. This feature is very handy, filing all of the books according to Subject (American History, European History, Ancient History, etc. ), and Genre (History Stories, Biographies, Legends and Folklore, etc.). You’ll also find book summaries and book series, as well as study aids, FAQs and a Teacher’s Guide. Another really fun feature is a catalog of images from the books. If you have an ereader, such as a Kindle Touch, you know that book images, especially color images, don’t shine in this format. So Heritage has included files of images from each book. In addition to all of these wonderful books, we also received a pre-printed Teacher’s Guide. While the Teacher’s Guide is available in PDF with each CD, for added convenience, you may purchase this guide pre-printed (in color) and 3-hole punched. All you have to do is add it to a 1 inch binder. The quality of the printing is excellent, and the covers, as well as other color pages, are just beautiful! It’s not likely that I would have printed the Guide to make a binder, but I love having it! You will especially want to consider purchasing this pre-printed guide if you don’t have a high-quality color printer. I especially love the accountability forms. I’ve added these to Ben’s history notebook so that he can easily track and record both which books he’s reading and how much time he’s spending reading them. We’re including books we check out from the library here as well. 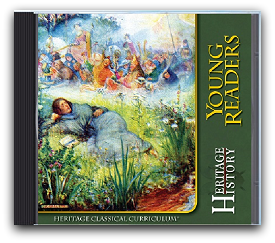 Click here to discover all of the titles included on this CD, or to order Heritage History’s Young Reader’s Collection. All of the CD sets are priced at the affordable cost of $24.99. For the Young Readers Collection, that’s about 30 cents a book! If you don’t have an ereader, now is the time to consider building that cost into your homeschool budget. It will more than pay for itself with products like Heritage Classical Curriculum. All 5 CD sets from Heritage Classical Curriculum were reviewed by members of the Homeschool Crew. To find out more about what my crew mates thought, click over to the Homeschool Crew blog.